Romain Grosjean says his Italian Grand Prix ban has helped him prepare for this weekend's race in Singapore. The Frenchman, 26, served a one-race ban at Monza for causing a four-car pile up at the start of the Belgian GP. Lotus team principal Eric Boullier made Grosjean watch the Italian race from the garage and pitwall, with Jerome D'Ambrosio in the cockpit of his car. "Apart from being in the car, I think it was the best preparation I could have for Singapore," said Grosjean. "Being on the pit wall with the engineers and looking at the data is always useful. "You get another perspective on how the cars are performing, where the differences are, what can be improved and so on." Grosjean is eighth in the drivers' standings with 76 points. His team-mate Kimi Raikkonen, meanwhile, has impressed in his first season back in Formula 1. The 2007 world champion, who spent the past two years competing in the World Rally Championship, is third with 141 points. "I can still learn a lot from Kimi [Raikkonen]. 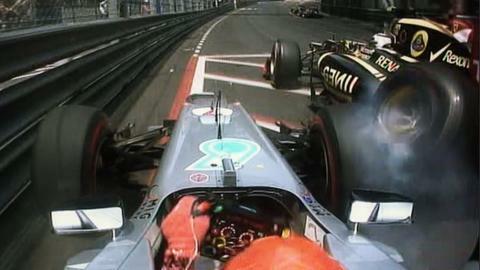 He has a huge amount of experience," added Grosjean. "As a team-mate he is both challenging and fantastic: challenging because he is so quick and has abilities I have yet to develop, but fantastic because he is also a great example to follow in the way he can switch his mind-set so quickly during a race weekend to be entirely focused on the job."